In a youthful twist to Coco-Cola’s 128 year old legacy of bringing people together, they have rolled out one of their most ambitious campaigns to date. The “Share a Coke” campaign, was first launched in Australia in 2012 and has since rolled out in more than 50 countries. 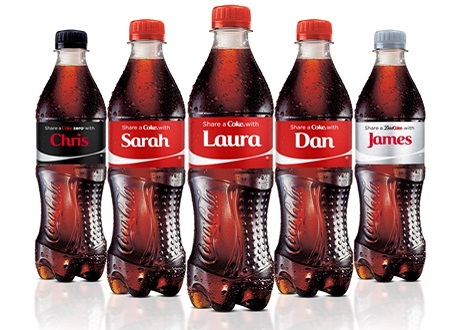 This year, it went bigger by extending this campaign in the U.S.
Coca-Cola took the most common names of the particular country and printed them on all of their bottles. It invited fans to find their names – as well as the names of family members, friends, co-workers and people they’d like to know better – on bottles of Coke, Diet Coke and Zero. They encouraged people to buy the bottle with their name, as well as one to share with your friend’s name on it. Shareable 1.25- and 2-liter bottles also sport group names like “Family” and “Friends”. Colloquial nicknames like “BFF,” “Star,” “Bestie,” “Legend,” “Grillmaster,” “Buddy” and “Wingman” appear on 12-oz. cans. The “Share a Coke” packaging rolled out in June and will remain on the shelves through August. A 500-stop, cross-country “Share a Coke” tour featuring travelling kiosks will enable fans to customize a Coca-Cola mini can for themselves and a second can for someone special. The tour will satisfy fans who can’t find their names on store shelves. One can also visit www.shareacoke.com to personalize virtual bottles and share them with friends via Facebook, tumblr, Twitter and Instagram. The campaign started with 250 names in Australia back in 2012 and now, it’s gone beyond thousands of names in over 50 countries. The spirit of ‘sharing’ is captured very well via their campaign communication and the personal touch is undeniably irresistible. How do you see a bottle with your name and your friend’s name on it and not pick it up? That’s why this is ingenious. Many brands would have thought of this without a doubt, but it takes a coca-cola to pull it off. Here is the commercial that is so beautifully made and well-scripted that it will leave you with a smile on your face. Coca cola never ceases to amaze. Never. Coke’s all about sharing and happiness in the act of it. But why sell only one Coke when you can sell two? Leo Burnett in Colombia devised a method to get freshmen at colleges to become friends — and sell twice the amount of soda — with “Friendly Twist,” a bottle with a new type of cap that can only be opened with another bottle of Coke. The insight here is that all of us feel isolated at the first day of college – no friends and no conversations.Coca cola tried to break the ice amongst the freshmen lot by creating this unique bottle. And of course, it doesn’t hurt that the call to action was a dual sell as well. A great idea based on a great insight. That’s how each and every one of Coke’s campaign go viral. Kudos Leo Burnett!